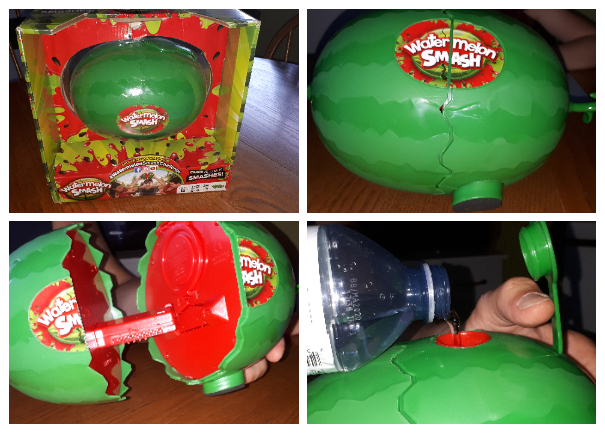 Brand new from Yulu Toys comes the game Watermelon Smash. Watermelon Smash is the perfect game for wet summer fun, though it also comes with the capability of dry play as well. 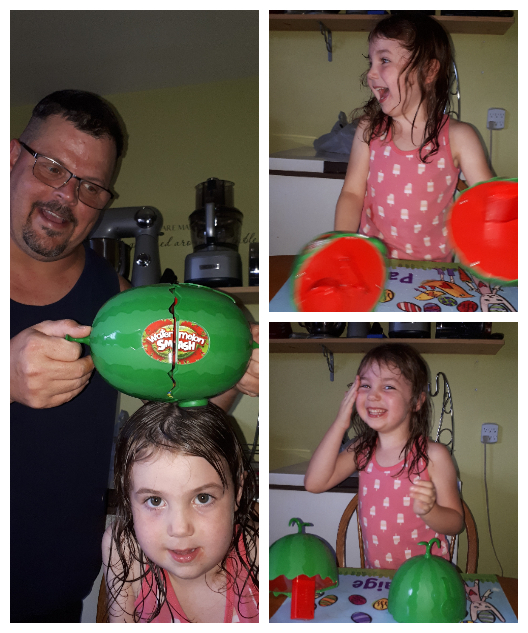 Recommended for ages 6+, Watermelon Smash ends with one player getting water (or the included plastic seeds) dumped on his or her head. The game comes with a plastic watermelon, a spinner, and blue and yellow watermelon seeds for indoor play. The plastic watermelon comes in two pieces. There is a rectangular bar on one piece and a hole on the other. When the two are connected, the watermelon is one whole piece. How to play: Fill the tank with water, push the two sides of the melon together, and you’re ready to go. On your turn, spin the spinner and do what it says, you’ll crack the melon on your head 1, 2 or 3 times, or you’ll pass it to the next player. 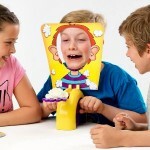 There is also a play where you get to crack it on someone else’s head. Don’t crack it too hard. Common sense applies here. 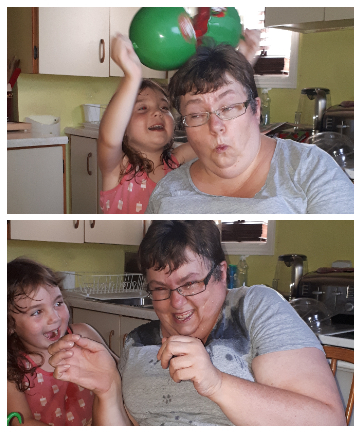 The game is full of suspense, because you never know when the watermelon will fully crack open. If it cracks on your turn, you either get covered with water (outdoor version) or plastic watermelon seeds (indoor version) and you are out of the game. The player who is dry at the end wins. 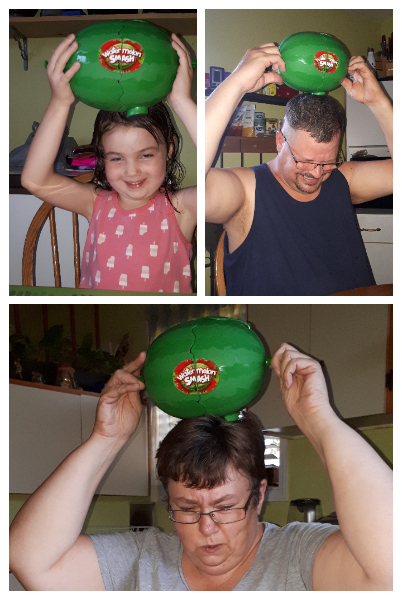 Though Watermelon Smash is designed for children 6 and up, our five year old daughter loved the game and wanted to play it again and again. 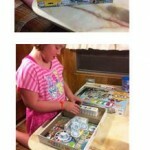 I loved how easy it was to set up and that she was able to play with no assistance. We prefer to use water instead of the plastic seeds. We play it indoor with water and there is minim mess. The watermelon doesn’t hold that much water, but it’s probably best to play in a space where water on the floor (in addition to the players) won’t be a problem or play it outside. The seeds are rather tiny and easy to misplace. I recommend storing them in a zip-lock bag when play is over. Also keep the seeds away from younger children. When you’re done playing, let the watermelon dry out before packing it away. 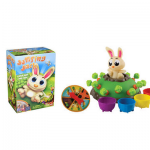 Overall, this is the perfect game to play with kids, or even adults! Take the #WatermelonSmashChallenge this summer. 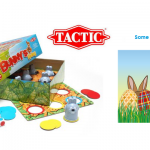 What is your favourite new board game? Established in 2015, YULU is a brand-driven international creator and manufacturer of toys and games that aim to promote an active lifestyle. 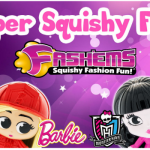 YULU, is completely committed and focussed on creating active play experiences with brands like Helix, Spy Code, Whacky Shots and many more to follow. YULU advocates the fundamental need for cognitive, physical, social and emotional development by creating indoor and outdoor toys and games. They believe that through active play, children nurture their creativity and develop problem-solving skills. Children become inquisitive about their surroundings and more interactive with people around them. Oh my goodness the kids would have so much fun with this!